Fortnite players on PC experience the error message ‘Cannot create service (StartService failed : 1058) when they try to launch Fortnite on their PC’s. This error message usually occurs when the game is being installed for the first time on any computer. 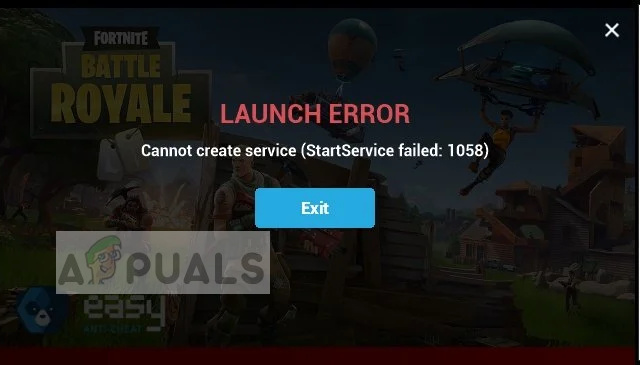 The reason why you experience this error is because Fortnite cannot locate the Anti-Cheat system it uses in its game. Every game has an anti-cheat system implemented to make sure that there are no mods or vulnerabilities which may affect the overall game experience. If you do not have this installed, you will not be able to launch the game. What causes Fortnite Error 1058? 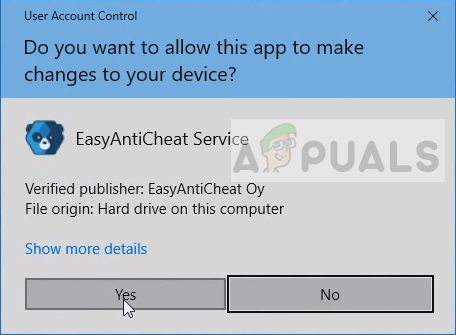 Anti-cheat system missing: Every game ranging from PUBG to World of Warcraft have anti-cheat systems installed to counter attempts to fool the game. If the game files are missing this, you will not be able to launch the game. Incomplete installation files: If Fortnite’s installation files are not complete, you will not be able to get it to launch. A reinstall mostly works in this case. 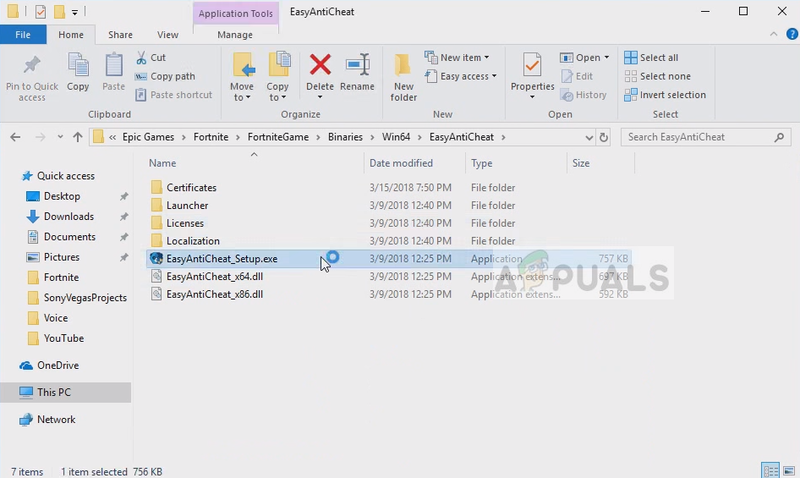 Missing Windows files: If your operating system’s installation files are either corrupt or missing, Fortnite will fail to launch since it running depends on various Windows components. Before we start fixing the error message, make sure that you are logged in as an administrator to this computer and have active internet access. Active internet access means that there are no proxies or firewalls and you are able to access the internet openly. 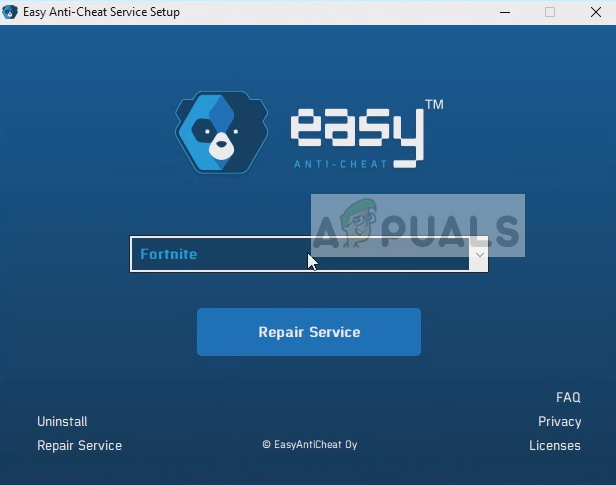 Fortnite usually comes prepacked with the anti-cheat system it needs for its functionality. However, there might be cases where the system doesn’t get installed by default and you have to manually navigate to the game directory and install it. Make sure that you are logged in as an administrator and if the game directory isn’t the default one, you should navigate there and follow the instructions. Here you will find the executable “EasyAntiCheat_Setup.exe”. Right-click it and select Run as administrator. Now make sure that the selection of Fortnite is done in the options. Click Repair Service. After the operation is done, restart your computer and try launching Fortnite again. Check if the error message is resolved. If installing the anti-cheat system doesn’t work, we can go ahead and try to reinstall Fortnite properly. There are numerous cases where after a bad potential update or after transferring game files, some of them might get corrupt which may be the reason why the launcher prompts an error message whenever you try to run it. Press Windows + I to launch the Settings application and navigate to the subheading of Apps. Now look through the entries and click on Epic games launcher. Select the Uninstall button present underneath. 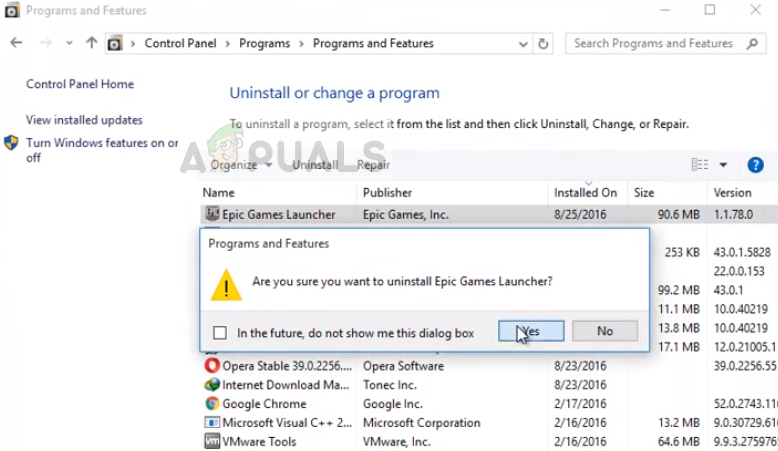 Another way to uninstall the game (if you are running an older version) is to press Windows + R, type “appwiz.cpl” and uninstall from there. Now restart your computer properly and download the entire application again. Check if the error message is resolved. Make sure that a correct graphics card is running your game. Make sure that the dedicated graphics card isn’t disabled for Fortnite. Run a System File Checker (SFC) scan to diagnose any missing Windows files. You have the updated version of Fortnite installed on your computer. DirectX and other binaries required are already installed in your system. Temporarily disable Antivirus software and other third-party applications which may interfere with the game.